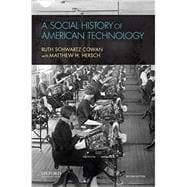 by Schwartz Cowan, Ruth; Hersch, Matthew H.
A Social History of American Technology, Second Edition, tells the story of American technology from the tools used by its earliest inhabitants to the technological systems--cars and computers, aircraft and antibiotics--that we are familiar with today. Ruth Schwartz Cowan and Matthew H. Hersch demonstrate how technological change has always been closely related to social and economic development, and examine the important mutual relationships between social history and technological change. They explain how the unique characteristics of American cultures and American geography have affected the technologies that have been invented, manufactured, and used throughout the years--and also the reverse: how those technologies have affected the daily lives, the unique cultures, and the environments of all Americans. Ruth Schwartz Cowan is Janice and Julian Bers Professor Emerita of History and Sociology of Science at the University of Pennsylvania. Matthew H. Hersch is Assistant Professor of History of Science at Harvard University. Each chapter ends with Notes and Suggestions for Further Reading. Conclusion: Was Industrialization Good or Bad for Workers? 20th-Century Technology: Blessing or Curse?